We finally got around to planting our annual batch of tomatoes and herbs (along with hot peppers and cucumbers). For a while, we'd talked about doing raised beds, but, to be honest, I don't think we're ready to commit to something like that. Between the produce we get from our coop and what we grow in our pots, we're doing just fine. That may change in the future, but, for now, we're content with what we have. At the end of a long day, I like to walk around and see how our plants are doing, often with a gin and tonic in hand. We've skipped over spring and are in full-blown summer mode here, which means we're all about the g+ts (or t+ts (tequila) or r+ts (rum)). Whatever it is, it has to be refreshing... something with bubbles and lots of lime. I'm also a fan of incorporating herbs into my drinks. For a fancy, gin and tonic, I'll add sprigs of rosemary to provide some aromatics. I bought strawberries at the store and quickly forgot about them (shame, I know). I remembered just before they started to turn and decided the perfect use for them would be a festive summer drink. A batch of simple syrup, with the berries and thyme, makes a wonderful seasonal cocktail. Here's to warm, sunny days... hopefully spent by a lake or beach! 1. To make the strawberry-thyme syrup, heat sugar and water in a small saucepan over medium-high heat. Whisk until sugar has dissolved. Add sliced strawberries and thyme and continue to cook until strawberries are mushy. Press the strawberries to release all their juices. Let syrup cool and strain through a fine mesh sieve. Syrup can be stored in a glass jar with a lid for up to 1 month. 2. To prepare each drink, pour gin, lime juice, and strawberry-thyme syrup into a highball glass. Add ice and top with soda water. 3. Garnish with sliced strawberries and thyme sprigs. A text came in from my mother the other week with a picture of my niece. She was holding her first popsicle, which, not surprisingly, she was enjoying tremendously. It brought back such sweet childhood memories. As a kid, I could eat those one after the next on a blistery summer day and never get tired of them. Ones with pieces of fruit in them were pure perfection. I'd plop down in front of the television and lick and chomp and slurp before it melted all over the floor. One of the many fun treats that came out of my cookbook shoot from a few weeks ago was a popsicle maker. I'd been holding back on purchasing one, thinking that it was kind of lame and gimmicky. That was until, of course, I actually tried making my own... on a 90 + degree day. And how magnificent that first bite was. Eric and I immediately looked at each other and blurted out with big silly grins on our faces: boozy popsicles. He suggested making a batch with sangria, which I thought was a fabulous idea. Instead of sweetening it with regular simple syrup, though, I decided to infuse them with some beautiful lavender my friend sent me from their trip to Hawaii. There were a few points during the heat wave we experienced last week when these came in handy. At five o'clock (or - ahem - maybe a little earlier than that), we'd get home and rush to the freezer. Needless to say, I expect a few more batches will be prepared over the next month and a half. Enjoy and stay cool everyone! 1. 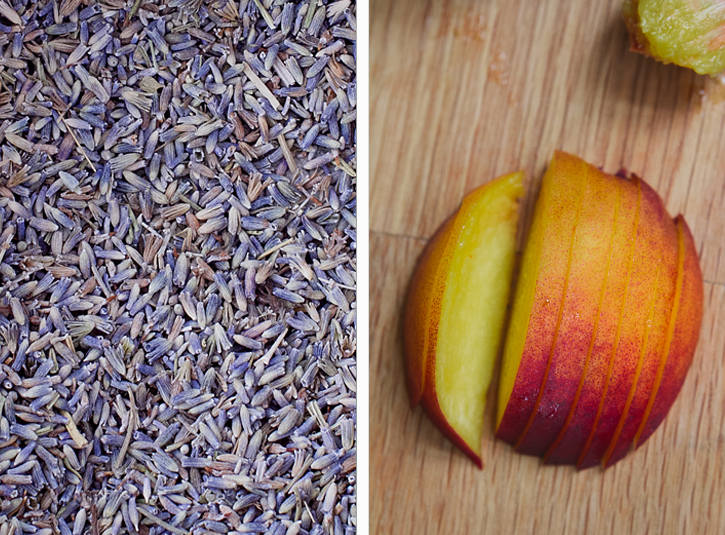 Make the simple syrup by bringing the water and lavender to a boil in a pot. Whisk in the sugar until fully dissolved. Reduce the heat to a simmer and let cook for another 5 minutes. Remove from heat and let steep for another 30 minutes. Once it has cooled, strain the syrup. 2. While the syrup is cooling, peel one ripe peach and cut it into large pieces. Place the peach into the bowl of a food processor along with the orange juice. Puree until blended smooth. 3. Transfer the peach mixture to a pitcher. Add the white wine and 1/2 cup lavender simple syrup. Stir to combine. 4. Thinly slice the remaining, unpeeled peach. 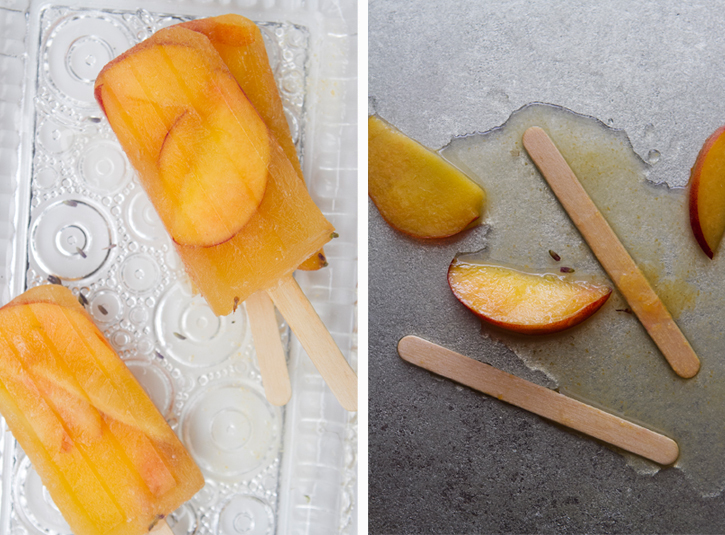 Place three peach slices inside the cup of each popsicle mold. Fill each mold with the sangria and put in the freezer until frozen. There was a point a few weeks ago when I just wanted to call a timeout. What was already a pretty packed July was rapidly getting busier. The e-mails, the requests, and the invitations kept coming in. I have trouble saying no. This is especially true when it comes to work, but it occurs with other engagements as well. A dinner? Sure! A trip? Of course! I want to agree to it all, afraid that declining will result in a missed opportunity. But I hit a point when I just had to politely inform folks that I was booked for the next month. Today, however, marks a number of deadlines for me. I've been working on a few marketing campaigns and a cookbook shoot for the last month and a half and the majority of the work wrapped this past weekend. I'm taking the day off before I gear up for three full days of work. Despite the heat and humidity, I'm heading outdoors, picnicking in the Boston Common where a music festival is currently underway. Before leaving you with today's recipe (or, in this case, a link to a guest post I did), I wanted to direct you all to the summer issue of FoodieCrush Magazine. If you don't already know about it, stop whatever you're doing and check it out. It's a beautifully designed publication from my friend Heidi and I'm so honored to have contributed photography for the last couple of issues. Oh, and it's FREE! Check it out here (and page 42 for the article I contributed to). Now, onto the guest post! The folks at Better Homes and Gardens asked me to take one of their recipes and give it a twist. 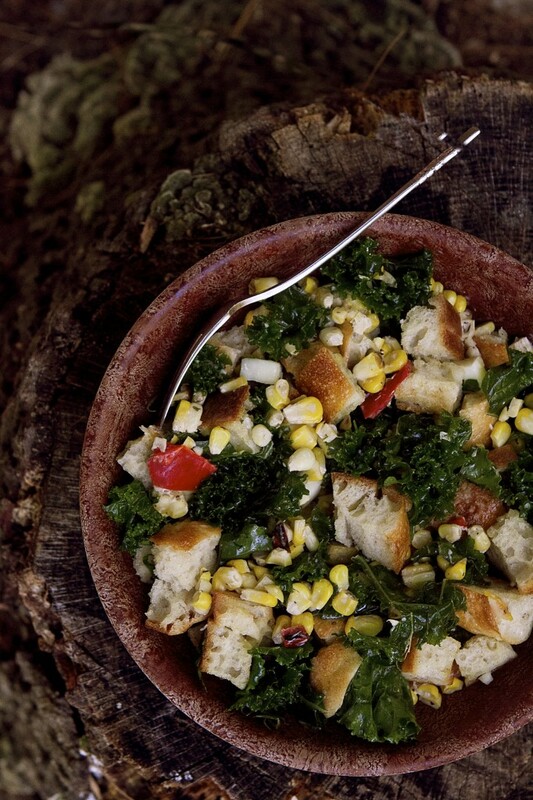 Originally, I had thought that a lightly dressed panzanella with some kale thrown in would do the trick, but I found that it actually wasn't all that interesting. Shaved corn and some chopped roasted red pepper added the sweetness (not to mention a shock of color) that the dish needed. Click over to see the original panzanella recipe from Better Homes and Gardens and to check out some of my alterations.